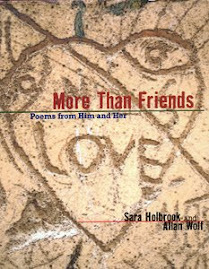 In More Than Friends Holbrook and Wolf respectively adopt the voice of a teenage girl and boy as they become "more than friends." Told in various form poems and free verse, the production goes the extra mile by adding notes about the forms (unobtrusively) at the end. It is a short book, but then, so are most teenage romances. However, the poets are able to pack a lot of emotion and "typical" teenage drama into the pages. It's not Degrassi-esque; AIDS, suicide, drugs, pregnancy, etc don't fill every other page, but the authors are careful not to patronize or trivialize the love story. Even if you've never had a highschool sweetheart, there are moments here almost anyone could relate to. Yes, it's told as through an adolescent's lips, but we've all convinced ourselves that veggie paninis are more than just sandwiches, haven't we? Is it wrong that I really want a veggie panini now? I'm sure there was more to the story than that nut that was all I could focus on. Sorry. Enjoyed the entire poem (as well as the others posted) except, what teenager do you know in this day and age who would use the word "smitten"? Brings to mind Sonya Sones' 'What My Mother Doesn't Know' this one though, is told entirely from the girls point of view. Not about teenage love but one I'd highly recomend is 'The Crazy Man' by Pamela Porter. A beautiful story told in prose-poetry, my son loved this book about a 12year-old girl growing up on a farm in Saskatchewan, 1965. I tell everyone who has pre-teens who don’t like to read about this one (moms and dads like it too)! Barbara: When you're hungry, you're hungry. Wanda: I agree with your "smitten" comment. A few times it did come across as adults posing as teens, but fortunately not often. Then, you never know what words might fly in and out of popularity or what word a particular teen might fixate on. I remember writing a piece for my highschool newspaper way back in the day and one teacher commented that he was surprised I used the phrase "hunky-dory."